A species of clog not indigenous to any other comfort footwear. Healthy, anatomic footbed shape. Flexible cork/latex footbeds and shock-absorbing soles. Available in two widths. Traditional clog with low back constructed of flexible polyurethane, featuring Birkenstock comfort contours molded in footbed. 100% waterproof, ideal for the garden. Classic clog in a variety of materials with adjustable strap and shock-absorbing EVA outer sole. Features Birkenstock’s classic suede-lined cork/latex footbed. Also available in kids sizes. Back-strap sandal in a variety of materials with fully adjustable straps and shock-absorbing EVA sole. Features Birkenstock’s classic suede-lined cork/latex footbed. 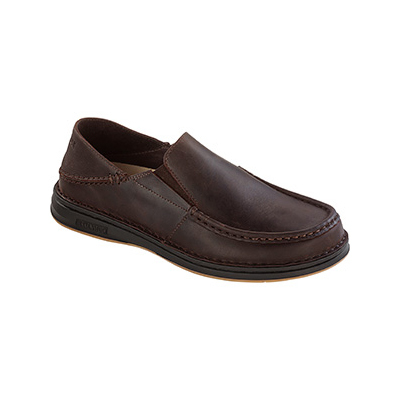 Also available as a completely non-leather sandal with Birko-Flor uppers and microfiber liner. sandal with Birko-Flor uppers and microfiber liner. Also available in kid’s sizes.